Shot Blasted PrepDiamond Shaved PrepFloor Marking MaintenancePaint Type & PerformanceUnprepared Line MarkingWhy Prepare? You are here: Home > Technical Section > Why Prepare? Warehouse lines and signs is an advocate of prepared floor marking, for the simple reason that line marking and floor coatings lasts longer if the concrete is prepared before applying a paint system. 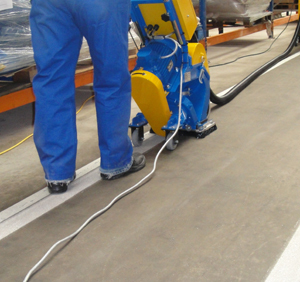 There are various methods of floor preparation, the most common being Shot Blasting. This is where a machine fires small beads at the concrete surface in a controlled motion. The impact of these beads causes the surface of the floor to break-up and come away, going to a depth of approximately 0.5mm – 2mm, that exposes a fresh surface. Another method of preparation is Diamond Shaving, less popular due to access to machinery and its specialist use. This is mostly used by companies applying line marking because of its coverage limitations. The process is by ‘shaving’ away the surface 1mm to 5mm below which creates a channel. A paint system is applied to the channel leaving in effect a recessed line that comes almost or level with the original floor surface. Other machines such as scrabblers and grinders also remove the surface, however they are less controllable presenting a less tidy finished, but nonetheless provide a prepared surface which is all important. Once a roughened and fresh surface is achieved, we use ‘dust extraction’ or vacuum units to ensure the new surface is free from dust and debris. The now ‘open’ (because the seal is removed) surface allows the paint to ingress and ‘key’ (adhere), making it very difficult to remove or to be damaged. Investing in line marking or an industrial grade floor coating is a considerably expensive project to justify, however if it must be a permanent feature then it must be durable. Therefore, 'preparation' should be your first priority. If you have questions after reading this and would like to speak to someone please feel free to contact us so we can help you further.